There are few things to consider when choosing a fly fishing equipment. While reels, lines, and fishing rods determine the ease with which you will catch your fish, hooks also play a significant role in determining whether the fish you catch will live or die immediately or soon after. How you catch fish also determines your success in catching your fish and safety. Unless you are out to get some quick seafood, it is vital to consider a lot of factors before choosing a fly fishing hook. There are two major types of fly fishing hooks that include barbless and barbed fishing hooks. Just as the names suggest, barbed hooks simply have barbs while barbless don't. Choosing the right one to use is always a challenge to many anglers and has led to a lot of arguments. There are those anglers who find barbless hooks more convenient and those who don't. 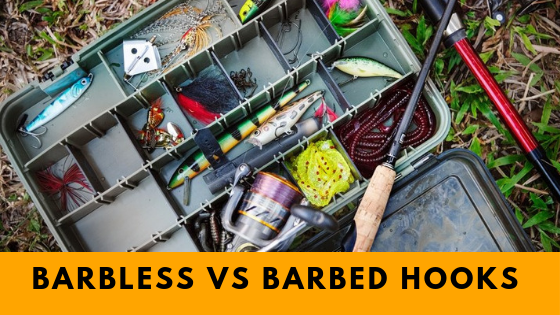 In this article we will try to compare barbless hooks and barbed hooks. Let's first understand the difference. Barbed hooks Barbed fly fishing hooks are simply hooks with the backward-facing barbs intended to hold the fish firmly on the hook immediately it swallows the bait. Many anglers use barbed hooks because they are fond of it while others use in special cases. Others think it isn't safe enough for a regular fly fishing. They prevent the fish from escaping easily - The fact that they are designed to offer a strong grip, barbed hooks Won't let your catch escape easily. Keeps the hook in place - Most anglers are fond of this hook simply because it keeps the fish trapped in one position making it harder for the hook to come out once the fish is caught. Easy to find - Because they are popular with many regular anglers around the World, barbed hooks are readily available in local shops, large retailers, online and many other places. It increases the risk of injuring your fish - If you intend to catch your fish, analyze it then let it go, then using barbed hooks won't do you any good, since they don't come out easily, when trying to release your fish which cause lot of damage especially if you don’t have the experience. It can easily injure you - Most probably if you fish for longer hours you might get hooked accidentally, and since barbs don't come out easily, they can easily injure you. When you ask anglers to tell you which type of hook serves them best, you will get varying answers. Some of them prefer barbed hook it holds fish in place. Others think the barbless hook is better since it reduces the risks of injuries. Others will use either or both depending on the occasion. For me, I would choose Barbless hook for these reasons. It is safe for use - As mentioned earlier; it is easy to get hooked when you are fishing for longer hours. The fact that barbless hooks are easy to remove reduces the chance of getting injured when trying to pull it out. As mentioned earlier; it is easy to get hooked when you are fishing for longer hours. The fact that barbless hooks are easy to remove reduces the chance of getting injured when trying to pull it out. Less injury to fish - When using a barbed hook, there is always a chance your fish won’t live afterward even when you let it go. Unless you have the experience of a doctor, trying to release it back into the Water might injure it more. On the other hand, barbless hooks pull out easily and will result in minor injuries even after some struggle. Barbless Fishing Hooks or Barbed Fishing Hooks? If my plans were to catch fish for food, then I would have no reason not to use barbed hooked, why? Once the fish gets hooked, it won't. In fact, this is the only advantage. The question is, can't barbless hooks do the same? If not, why are they used? In my opinion, using any hook requires some special fish catching skills and barbless hooks aren't exempted. With proper skills, you can always maintain your fish in its required position until you pull it out of the Water. One thing I have realized that, letting your fish sit in water after it strikes and swallows the hook allows it to escape. Barbed hooks are popular with anglers for one reason. They offer a firm grip preventing the fish from escaping. As a regular fisher, I find this awesome. But is this feature effective enough to catch more fish and keep me safe? Well, many anglers will say yes. In my opinion, it isn't. Despite the fact that I will do anything to go fishing on a Saturday, put my safety before everything, and that includes catching the fish. The last thing I want is getting hooked and not being able to remove the hook without further damages. For that reason, I choose barbless hooks. Lastly, I would prefer losing a fish than losing my hook. Barbed hooks won't let go, meaning that, if the fish is strong enough, it may pull out the hook itself leaving me with no other option, but to go home. Both barbed and barbless hooks offer astounding performance when it comes to fly fishing. I would choose barbed if I was in a hurry to get some food simply because I don't want fish pulling off the hook after struggling to get it. However, if I were looking for something much safer and will catch fish faster, I would go with barbless hooks. If you've been using barbed hooks, I guess you've noted some few drawbacks. As an experienced angler, recommend that you try barbless hooks to see the difference. Besides it won't cost you much. I hope you found this post helpful. Your comments and suggestions are welcome.